I went to the Summer of Love celebration to see if I could bring back a testimonial to the persistence of the counterculture these past three decades. The pictures I was looking for were not of celebrities  were not of what was happening on the stage. What I wanted to see was how we're all doing  after so many turns in the road, all of us who made it this far, who made their way back to the 'source'. What a beautiful day it was. One of those glorious October San Francisco days bestowed itself on the 30th gathering of the tribes in Golden Gate Park. I kept realizing throughout the day that so many of the elements from that first Be-In of 1967 were reflected in this event. I was especially looking for any Digger elements, and I found a true Free Feed. 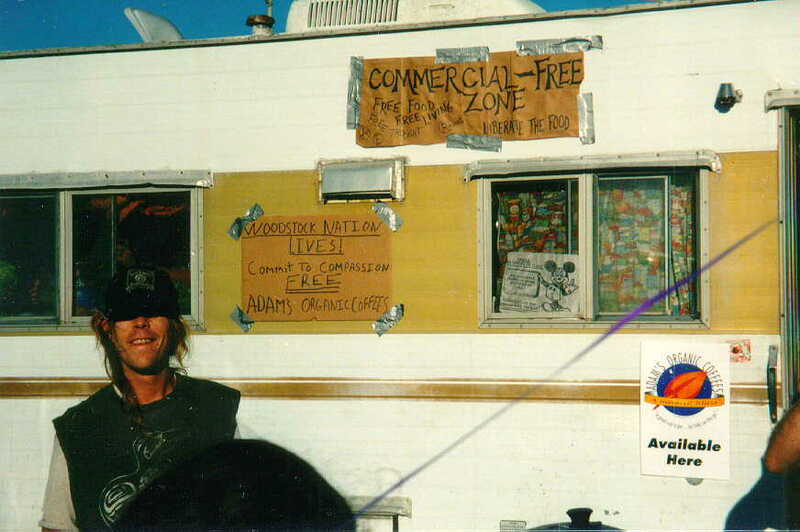 The itinerant People's Kitchen was serving non-stop meals, with gourmet java on the side, out of their reconditioned RV parked in the Bus Caravan by the beach. I think these photos more than anything that can be written are proof that the counterculture is strong and growing, in contradistinction to those who would declare that it died an early death in 1972 or thereabouts. As for the stage, not to ignore the efforts of those who helped focus the energy, there were apparently dozens of volunteers who worked selflessly to create the event. They have a Web page: www.summeroflove.org, and we truly appreciate their energy. Of the few people I recognized  Chet and Wavy kept the behind-the-scenes cooking, Peter Berg was up for a fiery appraisal, Diane DiPrima and Michael McClure gave inspired readings, and Cecil Williams got everyone to join hands and hearts to give peace a chance. The Charlatans were back together. The Starship had the place rocking. &tc. Who would've thought Jello Biafra in the role of Father Ginsberg? One helluva day. I kept thinking about all those who now are gone. But the kids (15-16 yr olds in abundance looking like the teenie boppers, and 18-25 yr olds looking like the wizened communards, we once were)  the kids knew what was happening. It felt very good to know that there's another generation coming along. The Beat goes on  what goes 'round comes 'round. I will add any other memorances that anyone would care to send for the archives. Update (10/27/97): E-mail brought a most pleasant surprise, a couple of pictures from the Morningstar folks who made their way to the Celebration. I've put these onto a separate page, called "Morningstar At The 30th." A couple dozen converted school buses, RV's, and vans stretched down the parking lot by the beach, looking remarkably like the hippie Bus Caravan that left San Francisco in 1970 under the guidance of Stephen Gaskin, guru of the Monday Night Class. (This weekly hip revival meeting took place at the Family Dog auditorium by the old Playland amusement center, just a few hundred yards from where this photo was shot.) The Caravan returned in 1971 to San Francisco, but soon left to find a permanent settlement, which would become The Farm in Summertown, Tennessee. (I remained in The City to find gainful employment to help pay the balloon mortgage on the Ortiviz communal ranch, and to find a more copacetic environment for a 21-year old gay man.) Stephen's teachings from this period are recorded in The Caravan, along with some great photos of the 60-odd vehicles that we drove cross-country.